The lowest-income region of the world, sub-Saharan Africa, has been having a surge of economic growth during the last decade or so. 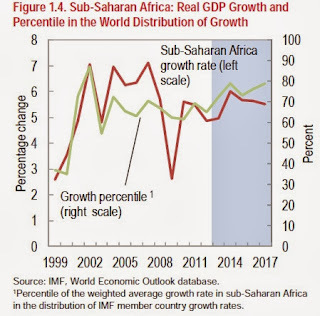 The IMF reviews the current situation in one of its Regional Economic Outlook reports, "Sub-Saharan Africa: Keeping the Pace," published in October. 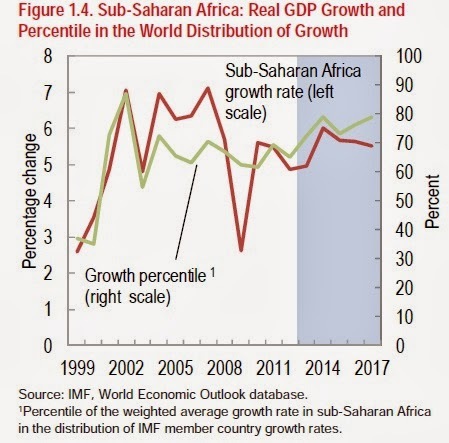 The red line on the figure shows the rate of real GDP growth in the region sub-Saharan African since the late 1990s, measured on the left-hand axis. The green line, measured on the right-hand axis, shows the growth rate in sub-Saharan Africa compared with the 188 IMF member countries. Economic growth in the sub-Saharan region as a whole in the last decade has consistently been above the median country, and in recent years has been in the 60th to 70th percentile. But this good news comes wrapped in some concerns. It's also been a time of high prices for oil and many minerals. Is Africa's economic growth really just about countries getting a better price for their minerals? Or is something deeper going on? The second chapter of the IMF report addresses this question head-on (as usual, footnotes and references to figure or tables are omitted for readability). "Sub-Saharan Africa has grown strongly since the mid-1990s. There is a common perception that this growth has been the result of relatively high commodity prices, particularly for natural resources such as oil and minerals, generating both higher commodity revenues and attracting substantial new investment. Although growth in some countries in the region is heavily dependent on the export of natural resources, many nonresource-intensive LICs [low-income countries] have also experienced rapid growth. In fact, 8 of the 12 fastest-growing economies in sub-Saharan Africa since 1995 were LICs considered nonresource-rich during this period, and as a group they have grown slightly faster than the oil exporters ..."
The chapter then focuses on telling the story of six of these nonresource-intensive low-income countries. 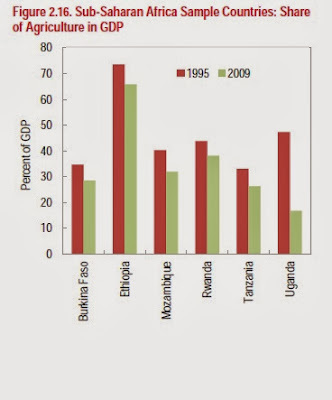 "All sample countries—Burkina Faso, Ethiopia, Mozambique, Rwanda, Tanzania, and Uganda—have achieved strong and sustained growth since the mid-1990s, despite not having exploited natural resources on a large scale during this period. The countries were chosen on the basis of having experienced real output growth greater than 5 percent on average during the period 1995–2010, and real per capita GDP growth of more than 3 percent over the same period." At the risk of oversimplifying the many details that differ across these six countries, I'd say that two main themes run through the discussion of their success. First, they enacted economic policies that made them attractive for investment, and capital arrived in the form of domestic investment, foreign direct investment, debt relief, and aid. Second, they saw a boost in their agricultural sector, which was a substantial share of the economy and a majority of the workforce and of poverty in all of these countries. high investment is likely to have supported high growth in the sample countries." Along with running more sensible macroeconomic policies and reducing the role of price controls, these countries also saw improved governance overall. "The sample countries registered improvements in governance relative to the comparator group in four out of the five dimensions considered in the World Bank’s Worldwide Governance Indicators: control of corruption, government effectiveness, political stability and absence of violence, and regulatory quality." These economic changes took effect in some important part through the agricultural sector. As economies develop, agriculture will typically play a smaller role in the economy, which as this graph illustrates has been happening for these six countries. But the share of GDP that is in agriculture may understate the importance of agriculture in economic development, because and even larger share of low-income workers are in the agricultural sector. "Most of the labor force in the sample countries remains concentrated in the agricultural sector, and more significant productivity increases will be crucial to promoting inclusive growth and lifting more people out of poverty. It is estimated that the bulk of the sample countries’ active labor force is engaged in the agricultural sector—about 80–81 percent in Mozambique and Burkina Faso, 71 percent in Uganda, and 65 percent in Tanzania ... Moreover, most of the extremely poor rely on subsistence farming for their livelihoods." 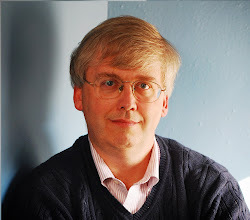 "Initial conditions are not so important. The majority of the countries in the sample are landlocked, and many were just emerging from conflict situations in the early 1990s. Postconflict and other fragile states can move onto rapid growth paths once a clear vision is formulated and consistently implemented."